Bureau B proudly presents: a brand new album of the krautrock institution, revered worldwide as pioneers of avant-garde rock music. Hypnotic, dadaistic, powerful, gentle, melodic, earthy, etheral. This is the sound of Faust. Faust: formed in Hamburg in 1970, one of the main protagonists of Krautrock. Successful overseas, viewed with suspicion at home. Now revered worldwide as pioneers of avant-garde rock music. "C’est com…com…compliqué" is their ninth studio album, recorded by Hamburg’s own sonic sorcerer Tobias Levin. "There is no group more mythical than Faust." Thus wrote English musician and eccentric Julian Cope in his classic of the genre, "Krautrocksampler". Which says it all really, neither the habitus nor the music of the six piece Hamburg group is easy to grasp. Whilst some lauded Faust as the best thing that ever happened to rock, others dismissed them as shameless Dilettantes. Their collage of Dadaism, avantgarde rock and free improvisation radically divided opinion. Their legend was built on the fact that, in the early days, they addressed the media through their producer and manager Uwe Nettelbeck (1940-2006). Precious little was known about the musicians themselves. When the first LP was unleashed on the world in 1971, Faust were very much the prophet in his own land, as the saying goes: few were interested in listening to their music - in Germany. Not so across the Channel: this is where Faust’s career really kickstarted. These monoliths of avant-garde rock sold a phenomenal 100,000 copies of their third album "The Faust Tapes", one of the first releases of the Virgin label, then in its infancy. Now that Krautrock has been revived, thanks to the efforts of bands such as Stereolab and Tortoise in the Nineties, Faust have become one of the biggest names to drop. Worldwide. Their concerts in the USA, Middle East, Japan and Europe are invariably sold out. 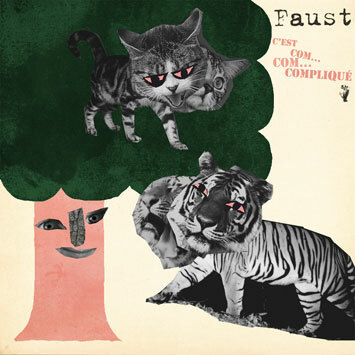 Almost 40 years since they began, Faust are issuing a brand new studio album. Original members Jean-Hervé Peron (www.art-errorist.de) and Werner "Zappi" Diermaier (www.zappi-w-diermaier.com) were joined in the Electric Avenue studio by Amaury Cambuzat (from the French post-rock combo Ulan Bator). "Star indie producer" Tobias Levin recorded. The results sound fantastic! Typically Dadaist lyrics (mostly in French) accompany repetitive, sporadically overflowing, patterns. Faust’s music combines seemingly contradictory elements: it rages, yet is gentle, it is monotonous yet melodic, earthy and still ethereal. Safe to say, it is unique.